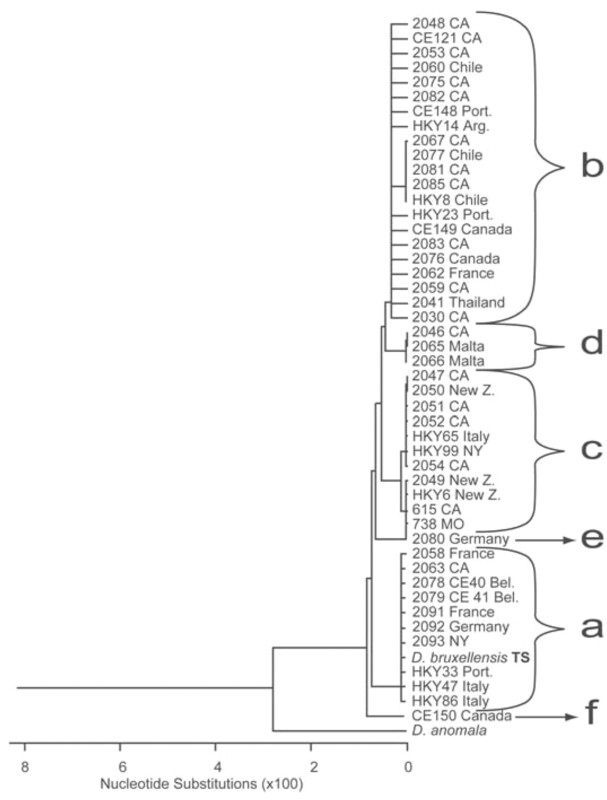 Brettanomyces bruxellensis isolates, primarily from wine, were selected for characterization by geographic diversity, vintage year of isolation, and variety of wine. A total of 47 isolates were characterized genetically by sequencing a portion of the 26S rDNA gene. Physiological differences were tested in a subset of 35 isolates. The majority of the strains characterized by the 26S rDNA sequence were grouped into one of six clusters. Some similarities of physiology were noted, but many traits were highly variable and did not cluster into the same groupings identified by the DNA analysis. Statistical analysis found 4-ethylphenol and 4-ethylguaiacol production to be the most discriminant characters. Dekkera/Brettanomyces bruxellensis has long been recognized as a common contaminant in wine (Custers 1940, van der Walt and van Kerken 1958). Brettanomyces can produce potent off-flavors (horse sweat, Band Aid, barnyard, and burnt plastic), which devalue the quality of wines. However, not all characteristics produced by Brettanomyces are universally disliked. There are anecdotal reports of Brettanomyces that grow faster or produce less acetic acid and of strains that only produce “good Brettanomyces” characteristics, but there is no rigorous analysis of any of these isolates. Studies have been done on the factors controlling the production of known chemicals that contribute to the characteristic flavors associated with Brettanomyces (Heresztyn 1986a,b, Ciani and Ferraro 1997, Rodrigues et al. 2001). Rodrigues et al. (2001) also investigated the effect of media components on a few strains, to develop a differential medium. Published data on some growth parameters are inconsistent. Rose and Harrison (1971) found that pyridoxine had a positive affect on the growth of Brettanomyces bruxellensis, while Uscanga et al. (2000) more recently found contradictory results. Different strains and different growth conditions were used in each case, which could explain the discrepancy in observations. Brettanomyces bruxellensis can utilize several carbon sources, including ethanol (Dias et al. 2003). The yeast produces a wide range of metabolites, the most significant of which are acetic acid and ethyl phenols, such as 4-ethylphenol and 4-ethylguaiacol (Chatonnet et al. 1995, 1997), and several other known and unknown compounds (Licker 1998). Although as many as 10 compounds are denoted as being related to the “Brett” defect in wines, 4-ethylphenol and 4-ethylguaiacol are two chemicals that have been specifically linked to the presence and activity of this yeast (Heresztyn 1986a,b, Chatonnet 1997). Recently, 4-ethylcatechol has been found as a Brettanomyces-related metabolite and is responsible for some of the aroma character found in Brettanomyces-contaminated wines (Hesford et al. 2004). O’Donnell (1993) reported the use of 26S rDNA gene primers to amplify a divergent region (D1/D2 region) demarcated by nucleotides 63-642 of the 5′-end of the large subunit of rDNA genes in Saccharomyces cerevisiae. The sequence of the region of the 26S rDNA gene was published for more than 500 yeast species and can be accessed via the Internet (Kurtzman and Robnett 1998, Altschul et al. 1990). Little information is available about physiological and genetic differences among Brettanomyces isolates from wine. In this work, 47 strains of Brettanomyces were characterized genetically and physiological characterization was performed on 35 of these isolates. The strains of Brettanomyces selected were isolated from wines from diverse geographic regions, from different vintage years, made with different varietals. The principal aim was to determine if the genotype, as defined by DNA sequencing, was linked to physiological traits important in enology. This information might allow assignment of certain physiological characteristics to specific genetic types among isolates of Brettanomyces. A second goal was to determine whether there are patterns among isolates from certain wines or geographic regions that may allow for the differentiation of strains that produce especially objectionable off-odors from strains with less or perhaps no negative impact on wine flavor. The characterization of subgroups of Brettanomyces might allow identification of rapidly growing strains that have more potential to damage the wine as opposed to slower growing strains with little flavor impact. A final goal was to establish whether genetic analysis might be useful in predicting growth and off-flavor impact in wine, thus being a useful guide for appropriate control and sanitation practices. Isolates were obtained either through purchase or donation from other collections, from private individuals, or by direct isolation (Table 1⇓). Strains that were isolated were plated directly onto Wallerstein Nutrient Broth (WLN, Fisher Scientific, Hampton, NH) medium with 10 mg/L cycloheximide (WLD, Sigma, St. Louis, MO). Forty-seven isolates have been genetically characterized, and physiological tests were also performed on 35 strains. All of the isolates are maintained at the Cornell Enology Yeast Collection and the UC Davis Wine Yeast and Bacteria Collection. Brettanomyces isolates, collections, origin, variety, and vintage. Cells were grown from single cell isolates and suspended in 10mM Tris-HCl buffer, pH 8. Lysate was obtained by boiling the cells in microfuge tubes for 10 minutes. The cell debris was removed by centrifugation at 14,000 x g and the supernatant removed to a clean microfuge tube for storage at 4°C. NL-1 and NL-4, primers specific for a portion of the large subunit (LSU) of the 26S rDNA gene of ascomycetous yeast were synthesized based on sequences from a previously published method (O’Donnell 1993, Kurtzman and Robnett 1998). Primers NL-1 (5′-GCATATCAATAA-GCGGAGGAAAAG-3′) and NL-4 (5′-GTCCGTGTTTCAA-GACGG-3′) were used in 50 μL Hot Start Taq MasterMix (Qiagen, Chatsworth, CA). Reagent concentrations were as recommended by Qiagen. The reaction was performed in a Gradient-Plus thermal cycler (Stratagene, La Jolla, CA). PCR reactions were carried out after one cycle of incubation for 15 min at 95°C. Amplification for the 26S rDNA fragment was accomplished in 40 cycles of denaturation at 95°C for 50 sec, annealing at 52°C for 50 sec, and elongation at 72°C for 2 min. A final step of 72°C for 10 min was part of the program. Amplification products were analyzed via electrophoresis at 100 V for 60 min in a 1% agarose gel stained with ethidium bromide following standard protocols (Sambrook et al. 1989). PCR products were then purified and concentrated for sequencing by using the QiaQuick PCR purification kit (Qiagen). Elution from the spin column with 30 to 50 μL of water concentrated the amplification product to the appropriate level required for sequencing following the standard methods used by the Cornell University Biotechnology Resource Center Sequencing Facility (www.brc.cornell.edu). Purified and concentrated PCR product was quantified and mixed with the same primers used for PCR. Approximately 1 μg of amplicon (10 μL) was mixed with 8 pmol of either forward or reverse primer. Sequencing reactions were carried out at the Cornell University Biotechnology Resource Center and separated on an Applied Biosystems Automated 3730 DNA Analyzer (ABI, Foster City, CA). The sequences from both strands were assembled and the result sequence analyzed with DNAStar analysis software (Lasergene, Madison, WI). DNA consensus sequences of the portion of the large subunit (LSU) of the 26S rDNA gene were submitted to a BLAST search on the National Center for Biotechnology Information web site (http://www.ncbi.nlm.nih.gov/blast/). Multiple sequences alignment was obtained using the MegAlign DNAStar analysis software package (Lasergene) with CLUSTAL W algorithm and default settings. Phylogenetic relationships were assessed with MegAlign DNAStar. Bootstrapping values were determined by using PHYLIP (http://evolution.genetics.washington.edu/phylip.html) (values <50% were not reported). Growth tests were conducted in a minimal medium based on that used by Heresztyn (1986a) consisting of 10 g glucose, 10 g fructose, 2 g ammonium sulfate, 2 g potassium phosphate monobasic, 250 mg calcium chloride, 250 mg magnesium sulfate heptahydrate, 1 mg thiamin HCl, 30 μg biotin, 8 μg iron chloride hexahydrate, 2 μg zinc sulfate heptahydrate, and 1 μg boric acid in 1 L water. Glucose and fructose were eliminated and substituted with 1 or 2% of a given carbon source in carbon experiments. Ammonium sulfate was eliminated and substituted with 0.1% of a given nitrogen source for nitrogen experiments. Growth tests were initially done in 96-well microtiter plates with 0.25 mL of media, and growth was determined visually using a Wickerham card. A minimum of two passages on each nutrient tested was used to deplete cellular reserves. The tests were replicated at least three times and any inconsistent results were repeated in test tubes with 2 mL of medium. Production of 4-ethylphenol (4-EP) and 4-ethylguaiacol (4-EG) was tested in wine. Grenache blanc juice was filter-sterilized to remove any indigenous Brettanomyces strains, then inoculated with Pasteur Red yeast (Red Star, Lesaffre Yeast). At 3 Brix the wine was centrifuged and filter-sterilized to remove the Saccharomyces and inoculated with ~104 cells/mL of the Brettanomyces strain to be tested. The Brettanomyces was allowed to grow for 6 weeks and then the wines were centrifuged to remove yeast before chemical analysis. ETS Laboratories (St. Helena, CA) performed the analysis of wine samples for 4-EP and 4-EG. The data were analyzed by cluster analysis (PAST, PAlaeontological STatistics, ver.1.12; http://folk.uio.no/ohammer/past), and discriminant analysis statistical procedures (R Project for Statistical Computing; http://www.r-project.org/). The targeted portion of the 26S rDNA was obtained by PCR for all 47 strains and sequenced. Analysis of the sequence indicated that all strains were Brettanomyces. The sequence alignment of the 26S rDNA portions was performed using ~470 bp. 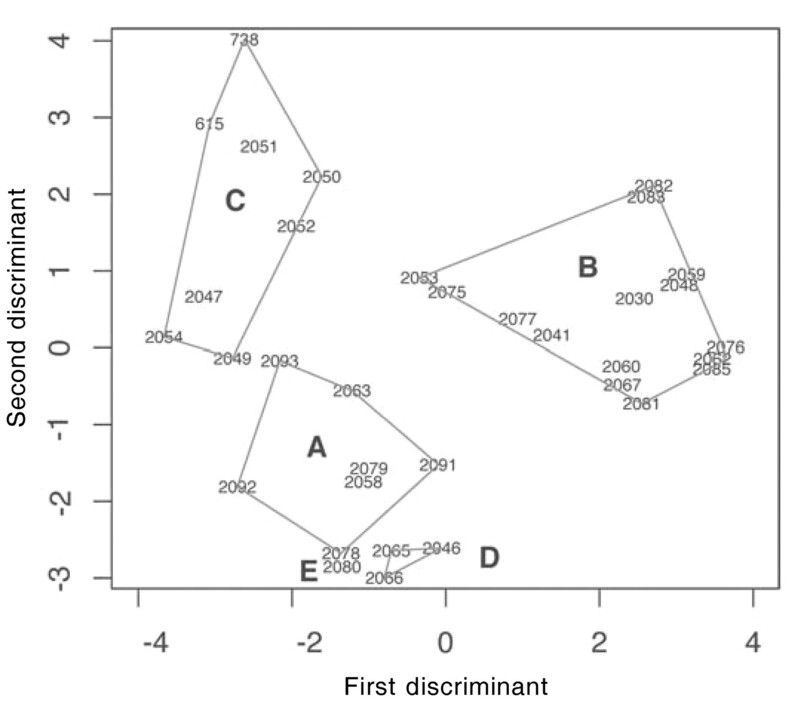 MegAlign analysis software produced a dendrogram (Figure 1⇓). Twenty-one strains, the majority, are grouped into the same cluster (group b). Eleven strains, including the type strain of D. bruxellensis, are grouped in a second cluster (group a), ten strains are grouped in a third (group c), and three are grouped in a fourth cluster (d). Two strains (2080-CE116 and CE150) were not grouped with any other strains. 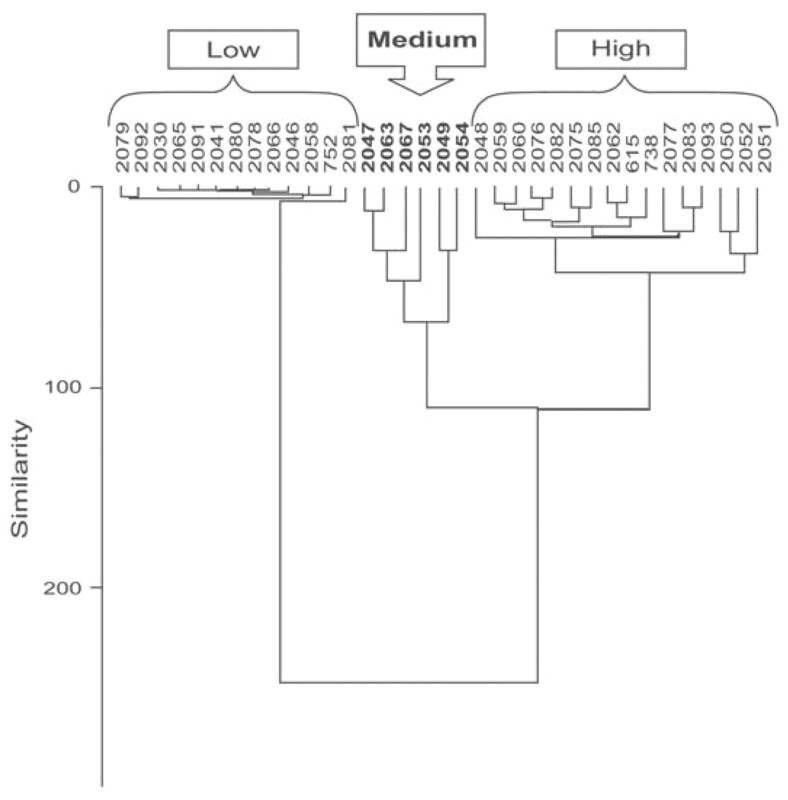 Bootstrapping assessed the robustness of the phylogenetic relationship among strains. A value of 84% bootstrap support was determined for the all B. bruxellensis strains in the data set. Among the individual groupings, a value of 63% was assessed for group a and 60% for group d.
Phylogenetic tree obtained by alignment of the sequenced portion of 26S rDNA (Arg. : Argentina; Bel. : Belgium; New Z.: New Zealand; Port. : Portugal; MO: Missouri; TS: type strain sequence). In order to evaluate the sequence of a non-rDNA related gene, we chose the ACT1 gene. ACT1 encodes actin, a major component of cytoplasmic microfilaments and an abundant protein in all eukaryotic cells. Due to structural constraints, the amino acid sequence of actin proteins from different eukaryotic species is highly conserved (Hightower and Meagher 1986, Pollard 1990, Hennessey et al. 1993, Welch et al. 1994). The ACT1 gene has been used extensively to infer interspecies relationships across broad evolutionary distances (Mertins and Gallwitz 1987, Wildeman 1988, Fletcher et al. 1994, Cox et al. 1995, Wery et al. 1996). Comparison of actin gene sequences has been successfully used to differentiate yeast species (Daniel and Meyer 2003). The portion of the ACT1 gene was also obtained with specific primers (J. Gafner and colleagues, 2003, personal communication) and sequenced for all 47 strains. Forty-seven sequences of approximately 617 bp were aligned and compared with a type sequence. This cluster analysis did not provide a useful intraspecific grouping of the strains (data not shown). The cultures were tested in minimal media for growth on different carbon sources (Table 2⇓). Most of the isolates could grow on the hexose monosaccharides glucose, fructose, galactose, and the disaccharides sucrose, maltose, cellobiose, and trehalose. Other sugars such as arabinose (pentose, monosaccharide), lactose (disaccharide), and raffinose (trisaccharide) did not support the growth of most of the isolates. The sugar alcohols adonitol (ribitol), glycerol, and mannitol also did not support the growth of most of the isolates. Few of the isolates grew on the organic acids lactate, malate, succinate, and citrate. Approximately 25% of the isolates could grow on ethanol as a sole carbon source, while less than 10% grew on soluble starch. None of these isolates was able to grow on cellulose or tartrate as sole carbon source under these conditions. None of the isolates could use the amino acids arginine or proline as a carbon source. All of the isolates required biotin and thiamin for growth. Summary of physiological characteristics of 35 Brettanomyces strains. All isolates grew on ammonium, proline, and arginine as a nitrogen source (Table 2⇑). Most of the isolates grew on nitrate when tested as a sole nitrogen source. All of the strains were tolerant to at least 10% ethanol when transferred into the minimal media with that percentage of alcohol. All isolates grew at pH 2.5, and 94% of them grew at pH 2.0. Slightly more than one-third of the isolates grew at 37°C and slightly less than one-third grew at 10°C. Three of the isolates could grow at both 37 and 10°C. Production of 4-EP and 4-EG. Almost half of the isolates produced high levels of 4-EP (>2000 μg/L) and 4-EG (>1500 μg/L) when grown in a sweet Grenache rosé wine (Table 3⇓). The remaining isolates were almost evenly divided between those that produced a moderate amount of 4-EP (1000 to 2000 μg/L) and 4-EG (700 to 1000 μg/L), a low amount of 4-EP and 4-EG (5 to 60 μg/L), and essentially no 4-EP or 4-EG (<4 μg/L). 26S rDNA genetic profile compared to the strain origin, SO2 tolerance, growth on ethanol and at 10°C, and volatile phenol production. Comparison of genetic and physiological data. Genetic and physiological data were compared for 35 Dekkera/ Brettanomyces bruxellensis strains. Based on the dendrogram obtained by comparing the sequence for a portion of the 26S rDNA gene, each strain was assigned to a specific group (Figure 1⇑). These genetic differences were compared with the results of physiological tests available for 35 strains. The data were analyzed by cluster analysis (PAST, PAlaeontological Statistics) and discriminant analysis statistical procedures (R Project). The hierarchical cluster (Single Linkage–Euclidean) divided the 35 strains into three large groups (Figure 2⇓). One group included all strains with a production of 4-EP and 4-EG less than 100 μg/L. The other two groups were characterized by strains that produced ~1000 μg/L and by strains that produced greater than 2000 μg/L of 4-EP and 4-EG, respectively. Statistical analysis found 4-EP and 4-EG production to be the most discriminant character. Cluster analysis of the physiological-genetic data matrix. Text boxes are highlighting the fact that the defined groups are characterized by a different production of ethyl phenols. Low: <100 μg/L (13 strains); medium (in bold font): ~1000 μg/L (6 strains); high: ~2000 μg/ L (16 strains). Linear discriminant analysis is a widespread parametric method for classification purposes. Stepwise discriminant analysis (Powers and Keith 1968) is a method for seeking subsets of variables most useful to discriminate among classes. The forward selection approach was chosen in our case. For the classification according to 26S rDNA sequence, the chosen variables were production of 4-EP, ability to grow at 37°C (DEG), sulfite tolerance (SOT), and ability to metabolize ethanol (ETH), maltose (MAL), succinic acid (SUC), citrate (CIT), soluble starch (SS), and glycerol (GLY). Using these selected variants, linear discriminant functions and correct classification percentages were calculated. This discriminant function primarily depends on the inability of the yeast to use ethanol, maltose, and succinic acid as the sole carbon source and on the ability to grow on soluble starch. The ability of yeast to use citric acid as a carbon source has the greatest influence, followed by the ability to grow at 37°C. The predicted groups are shown in Figure 3⇓. Predictions on the first two discriminant functions calculated based on the 26S rDNA physiological-genetic profile. Groups are enclosed by their respective convex hulls. The first two linear discriminants account for 63% and 31% of the trace (between-group variance), respectively. A summary of the genetic profile of each strain and the physiology parameters of highest enological interest are shown in Table 3⇑. The 26S rDNA groupings show the following information. In group a, 80% of the strains are of European origin and 57% of those tested grew on ethanol as a carbon source and grew at 10°C; while 71% produced low or no 4-EP or 4-EG in our test wine. Group b was the largest group with 81% of the isolates from North or South America, none of those tested grew on ethanol, and only one strain grew at 10°C. Group b also had a high percentage of high 4-EP and 4-EG producers (80%), and over 50% of the isolates were resistant to 50 mg/L SO2 at pH 3.4. Group c strains were from the United States (64%) and New Zealand (27%), with only one from Italy (9%). All group c isolates tested grew at 10°C, were not very resistant to SO2, and produced moderate to high levels of 4-EP and 4-EG. Groups d and e had only four members total, showed low tolerance to SO2, and had low production of 4-EP and 4-EG. Data in Figure 1⇑ show how the strains characterized by the 26S rDNA sequence are grouped and how similar they are to the reference sequence of D. bruxellensis (from http://www.ncbi.nlm.nih.gov). This comparison also shows that all strains characterized thus far are the same species, B. bruxellensis. In general most yeast strains in the same species have not shown differences in the 26S rDNA (Kurtzman and Robnett 2003). However, we observed differences in the B. bruxellensis isolates that described six subgroups, which is in agreement with Boekhout et al. (1994). Some researchers have suggested that a diverse group of B. bruxellensis is spread throughout the world (Arvik et al. 2002), which may be true. However, in the 26S rDNA grouping we obtained, 80% of the strains in group a were isolated in Europe and 81% of the strains in group b were isolated in the Americas (Figure 1⇑). While there appear to be groupings according to geographic origin based on the 26S rDNA sequence, there are also similarities among some isolates from different regions. For example, in group a there is a single isolate from New York and from California, while the remainder of the strains were isolated in Europe. Similarly among the group b isolates, which were primarily New World in origin, there were two strains from Portugal, one from France, and one from Thailand. Two hypotheses may be formulated. First, similar winemaking practices and wine types may select for similar strains. We cannot speculate what those practices or wine types might be and do not have any evidence indicating that the variety or vintage of wine is important in these groupings. Further studies of wine that has been colonized by different Brettanomyces may reveal some important parameters. Second, strains of Brettanomyces could be spread throughout the world, possibly through cooperative wine-making practices or through blending of wines. A more extensive study of strains isolated from different geographic regions would be required to support either hypothesis. A larger study would also help clarify the phylogenetic relationship of B. bruxellensis isolates as indicated by the bootstrap analysis. Such further analysis might indicate whether there are different points of origin for genetically different groups of B. bruxellensis. Physiological tests also reveal subgroups of B. bruxellensis (Table 3⇑). By comparing sufficiently large sets of genetic fingerprints and physiological characteristics, we hope to determine whether there are distinct groups of B. bruxellensis, which have a distinct growth behavior and a distinct flavor impact on wine. Thus far, our results allow a clear differentiation of isolates and several subgroupings. With the detailed genetic typing of wine isolates, offered by sequence analysis of the 26S rDNA, we can reliably identify unknown yeast and help track the spread of contaminating individual strains of yeasts through a winery or cooperage. The ability to identify a microorganism and track it, combined with knowledge of the biological properties of the strain, allows a winemaker to devise strategies to protect the wine from uncontrolled growth and potential spoilage by Brettanomyces. In order to better estimate the growth potential and flavor impact of particular isolates, it will be necessary to define more specific genes related to the critical pathways of off-flavor production to further refine groupings of Brettanomyces. The B. bruxellensis isolates were able grow on a variety of carbon and nitrogen sources, but the growth was even more variable than previously reported (Smith 1981). The diversity of carbon utilization patterns is impressive and makes it difficult to use those patterns as a taxonomic tool. None of these isolates used cellulose alone as a carbon source, as was reported for a Brettanomyces custersianus strain (Spindler et al. 1992), but many could grow on cellobiose, which is the ß 1–4 linked disaccharide of glucose that makes up cellulose. Both arginine and proline served as nitrogen sources for all of the isolates. Arginine and proline can be the most abundant amino acids in grape juice (Kliewer 1967), and if other nitrogen sources are available, then they may be left behind in finished wine. However, none of the isolates tested used arginine or proline as a sole carbon source aerobically or anaerobically. Although only 25% of the isolates could use ethanol as a carbon source, this result may still concern winemakers who do not attempt to control the growth of Brettanomyces in finished dry wines. Even if no residual sugar is present, there is a population of Brettanomyces that would find it possible to grow on the ethanol in the bottle. Van der Walt and van Kerken (1958) observed that all 79 isolates of Brettanomyces that they tested from South African wines required exogenous sources of biotin and thiamin for growth. That observation was confirmed for the 35 strains examined in this study. No two isolates were exactly the same in all characteristics tested. Production of 4-EP and 4-EG was also highly variable in the wine tested. Almost one-half of the isolates produced a large amount of both compounds while the other half produced amounts ranging from <4 μg/L to >1000 μg/ L of 4-EP and 4-EG (Table 3⇑). Production of 4-EP and 4-EG has been used as a method to detect the presence of Brettanomyces in wine, but it may not be useful for many strains. We also know that there are other flavor components produced by Brettanomyces that may negatively impact the character of the wine and would not be detected by simply measuring 4-EP and 4-EG. If the variability we see is true for other wines as well, then it may prove difficult to predict how Brettanomyces will ultimately affect the flavor of a wine. Further study to determine how substrates and growth conditions affect the production of flavor compounds by Brettanomyces is necessary. However, the highly variable production of ethyl phenols defined the existence of strains with differing capacities to metabolize hydroxycinnamic acid. This may help to explain those cases where the microorganism was isolated but not associated with any off-flavor. This is the first study in which strains of Dekkera/Brettanomyces bruxellensis are analyzed and compared by genetic and physiology aspects. Our results show that some of the physiological parameters studied are related to the genetic groups established by comparing the sequence of a part the 26S rDNA gene. Specifically in 26S rDNA groupings, the production of 4-EP and 4-EG, the ability to grow at 37°C, to metabolize ethanol, maltose, succinic acid, citrate, soluble starch, and glycerol contribute to differentiation among the groups with a very good degree of separation. Moreover, our results indicate that there may be B. bruxellensis with a characteristic European genetic profile that still exists as a subgroup (group a). There may also be a subgroup that occurs in the Americas (group b) that may be indigenous to that region. Group c, which contains isolates primarily from the United States and New Zealand, seems to be intermediate to these groups both genetically and physiologically. Determining the precise evolutionary relationships among isolates from different regions would require analysis of many more isolates than were available for this study. The data also indicate that group b is particularly dangerous and difficult to control in a winery situation because of its high SO2 tolerance and high level of 4-EP and 4-EG production. The genetic and physiological characterizations of a number of Brettanomyces bruxellensis isolates allowed their separation into distinct groups. Although the analyzed genetic sequence was not specifically related to any of the studied physiology traits, discriminant analysis allowed us to characterize each genetic group with a different physiological pattern. In order to determine whether the effect of Brettanomyces on wine aroma and flavor can be predicted, it will be necessary to define more specific gene(s) related to the critical pathways of off-flavor production and to correlate them to growth conditions and substrate utilization. Acknowledgments: We thank Dr. Jürg Gafner and his group for allowing us to use their actin primers, Dr. John Barnard, who performed the majority of the statistical analysis, the Cornell Enology group for their input in discussion, and Dr. Angela Baldo for helpful discussions and advice on computational analyses. We also thank the American Vineyard Foundation and the California Competitive Grant Program for Research in Viticulture and Enology for funding this research and the New York State Agricultural Experiment Station. The first two authors were equally responsible for the writing and preparation of this manuscript. The genetic analysis was done at Cornell University and the physiological analysis was done at UC Davis. Altschul, S., W. Gish, W. Miller, E. Myers, and D. Lipman. 1990. Basic local alignment search tool. J. Mol. Biol. 215:403–410. Arvik, T.J., L. Conterno, and T. Henick-Kling.2002. Brettanomyces bruxellensis in New York State wines: A global issue. In Proceedings of the 31st Annual New York Wine Industry Workshop. T. Henick-Kling et al. (Eds. ), pp. 124–125. Cornell University, New York State Agricultural Experiment Station, Geneva. Boekhout, T., C.P. Kurtzman, K. O’Donnell, and M.T. Smith. 1994. Phylogeny of the yeast genera Hanseniaspora (anamorph Kloeckera), Dekkera (anamorph Brettanomyces), and Eeniella as inferred from partial 26S ribosomal DNA nucleotide-sequences. Int. J. Syst. Bacteriol. 44:781–786. Chatonnet, P., D. Dubourdieu, and J.N. Boidron. 1995. The influence of Brettanomyces/Dekkera sp. yeast and lactic acid bacteria on the ethyl phenol content of red wines. Am. J. Enol. Vitic. 46:463–468. Chatonnet, P., C. Viala, and D. Dubourdieu. 1997. Influence of polyphenolic components of red wines on the microbial synthesis of volatile phenols. Am. J. Enol. Vitic. 48:443–448. Ciani, M., and L. Ferraro. 1997. Role of oxygen on acetic acid production by Brettanomyces/Dekkera in winemaking. J. Sci. Food Agric. 75:489–495. Cox, G.M., T.H. Rude, C.C. Dykstra, and J.R. Perfect. 1995. The actin gene from Cryptococcus neoformans: Structure and phylogenetic analysis. J. Med. Vet. Mycol. 33:261–266. Custers, M.T.J.1940. Onderzoekingen over het gistgeslacht Brettanomyces. Thesis, Delft University, The Netherlands. Daniel, H.M., and W. Meyer.2003. Evaluation of ribosomal and actin gene sequence for the identification of ascomycetous yeasts. International Specialized Symposium on Yeast. 26–29 August 2003, Budapest. Dias L., S. Pereira-da-Silva, M. Tavares, M. Malfeito-Ferreira, and V. Loureiro. 2003. Factors affecting the production of 4-ethylphenol by the yeast Dekkera bruxellensis in enological conditions. Food Microbiol. 20:377–384. Fletcher, L.D., J.M. McDowell, R.R. Tidwell, R.B. Meagher, and C.C. Dykstra. 1994. Structure, expression and phylogenetic analysis of the gene encoding actin 1 in Pneumocystis carinii. Genetics 137:743–750. Hennessy, E.S., D.R. Drummond, and J.C. Sparrow. 1993. Molecular genetics of actin function. Biochem. J. 282:657–671. Heresztyn, T. 1986a. Formation of substituted tetrahydropyridines by species of Brettanomyces and Lactobacillus isolated from mousy wines. Am. J. Enol. Vitic. 37:127–132. Heresztyn, T. 1986b. Metabolism of volatile phenolic compounds from hydroxycinnamic acids by Brettanomyces yeast. Arch. Microbiol. 146:96–98. Hesford, F., K. Schneider, N.A. Porret, and J. Gafner. 2004. Identification and analysis of 4-ethyl catechol in wine tainted by Brettanomyces off-flavor. Abstr. Am. J. Enol. Vitic. 55:304A. Hightower, R.C., and R.B. Meagher. 1986. The molecular evolution of actin. Genetics 114:315–332. Kliewer, W.M. 1967. Annual cyclic changes in the concentration of free amino acids in grapevines. Am. J. Enol. Vitic. 18:126–137. Kurtzman, C.P., and C.J. Robnett. 1998. Identification and phylogeny of ascomycetous yeasts from analysis of nuclear large subunit (26S) ribosomal DNA partial sequences. Ant. Leeuwenhoek 74:331–371. Kurtzman, C.P., and C.J. Robnett. 2003. Phylogenetic relationship among yeast of the ‘Saccharomyces complex’ determined from multigene sequence analyses. FEMS Yeast Res. 3:417–432. Licker, J.L.1998. The sensory analysis and gas chromatographyolfactometry (GCO) of wines with “Brett” flavor. Master’s thesis, Cornell University. Mertins, P., and D. Gallwitz. 1987. A single intronless actin gene in the fission yeast Schizosaccharomyces pombe: Nucleotide sequence and transcripts formed in homologous and heterologous yeast. Nucleic Acids Res. 15:7369–7379. O’Donnell, K.1993. Fusarium and its near relatives. In The Fungal Holomorph: Mitotic, Meiotic and Pleomorphic Speciation in Fungal Systematics. D.R. Reynolds and J.W. Taylor (Eds. ), pp. 225–233. CAB International, Wallingford, UK. Pollard, T.D. 1990. Actin. Curr. Opin. Cell. Biol. 2:33–40. Powers, J.J., and E.S. Keith. 1968. Stepwise discriminant analysis of gas-chromatographic data as an aid in classifying the flavor quality of foods. J. Food Sci. 36:207–213. Rodrigues, N., G. Gonclaves, S. Pereira-da-Silva, and M. Malfeito-Ferreiria. 2001. Development and use of a new medium to detect yeasts of the genera Dekkera/Brettanomyces. J. Appl. Microbiol. 90:58–599. Rose, A.H., and J.S. Harrison.1971. The Yeasts. Vol. 2. Academic Press, London. Sambrook, J., E.F. Fritsch, and T. Maniatis.1989. Molecular Cloning: A Laboratory Manual. 2d ed. Cold Spring Harbor Laboratory, Cold Spring Harbor, NY. Smith, M.T.1998. The Yeasts: A Taxonomic Study. 4th ed. C.P. Kurtzman and J.W. Fell (Eds. ), pp. 174–177. Elsevier, Amsterdam. Spindler, D.D., C.E. Wyman, and K. Grohmann. 1992. Evaluation of the cellobiose fermenting yeast Brettanomyces custersianus in the simultaneous saccharification and fermentation of cellulose. Biotechnol. Lett. 14:403–407. Uscanga, M.G.A., M.L. Delia, and P. Strehaiano. 2000. Nutritional requirements of Brettanomyces bruxellensis: Growth and physiology in batch and chemostat cultures. Can. J. Microbiol. 46:1046–1050. van der Walt, J.P., and A.E. van Kerken. 1958. The wine yeasts of the Cape. Part I. A taxonomic study of the yeasts causing turbidity in South African table wines. Ant. Leeuwenhoek 24: 239–251. Welch, M.D., D.A. Holtzman, and D.G. Drubin. 1994. The yeast actin cytoskeleton. Curr. Opin. Cell. Biol. 6:110–119. Wery, J., M.J. Dalderup, J. Ter Linde, T. Boekhout, and A.J.J. Van Ooyen. 1996. Structural and phylogenetic analysis of the actin gene from the yeast Phaffia rhodozyma. Yeast 12:641–651. Wildeman, A.G. 1988. A putative ancestral actin gene present in a thermophilic eukaryote: Novel combination of intron positions. Nucleic Acids Res. 16:2553–2564.